National Symbols of Gaston, includ the National Flag, the Coat of Arms of the Kingdom, the Black Orchid, the National Motto and the National Anthem, are manifestations of important historical value, which aim to convey the feeling of national unity and show the country’s sovereignty . The Flag carries within itself the origin of the Kingdom of Gaston and the symbolism as its importance. The Sautor (cross of Saint Andrew) dark red reflects the connection of the Kingdom to the Catholic Church and the Serene House of Braganza, from which belongs Don Florian, the first monarch of Gaston. The crown centered on the Sautor is distinctive of power, light and monarchy. It symbolizes superiority and exalts values associated with rationality, nobility. However, the crown also symbolizes humility, because when the monarch bows down, the head declines. The golden tone that protects the cross is the reproduction of gold, wealth, majestic. The blue that completes the flag is a tribute to Our Lady of Navigators, title given to the Mother of Jesus, Mary. It is itself seen as a protector of the storms and other dangers that the sea and the rivers offer to the Kingdom, since it is surrounded by the Ocean. 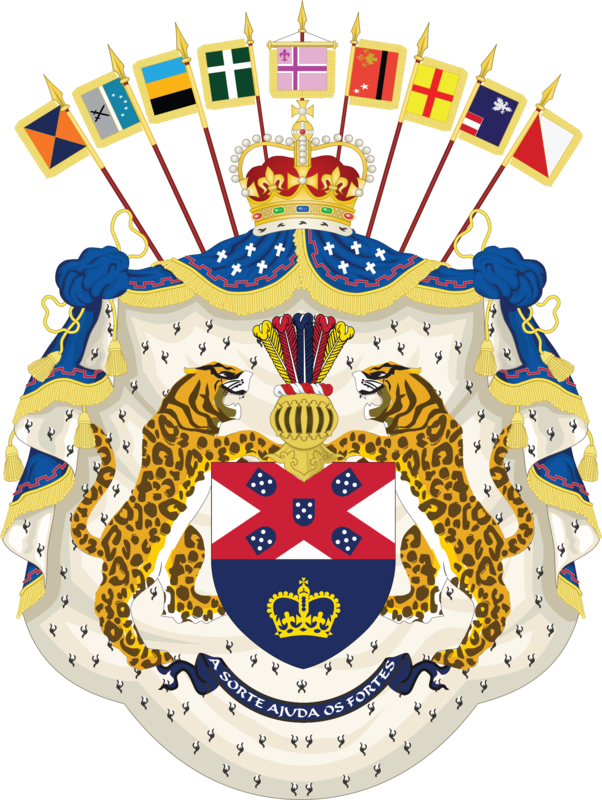 The coat of arms of the Kingdom of Gaston consists of representing a royalty as the political center of the country. At its top is a crown, which depicts the symbol of the nation, a base of the whole Kingdom, respect and protection of sovereignty. The crown also represents the royal power of a monarchical Right. 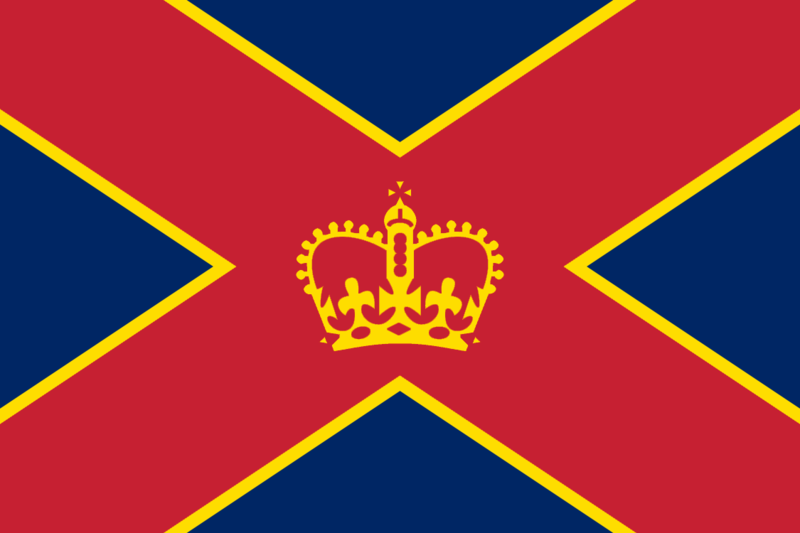 Behind the royal mantle stand as flags of the Counties and Kingdom Archipelago. Inside the mantle is the lanceolate shield cut into two partitions with a horizontal trace, from the right flank to the left of the shield. In the upper part is represented a portuguese lineage, the Serene House of Braganza, from which belongs Don Florian. The blue means the sea, they are like graces of Our Lady of Navigators, a holy patron of the country. The shield is supported and defended by two white-bellied tigers, who touch the helmet, which reproduce the knights who fought for the independence of the Kingdom. On the border is the motto of Gaston’s Kingdom. 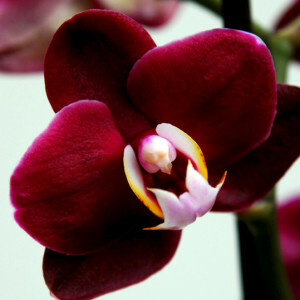 The Gaston national flower is the red orchid, original symbol of Florian dynasty. God Bless Gaston, (Portuguese: Deus abençoe Gastón) is the national anthem of kingdom. It was adopted in 1939. The letter is from Maria Amalia Guerreiro (date 1938) and is sung on a song attributed to Antonio Lucio Vivaldi. Land of seas and mountains. and those who sought his glory. and live in my heart.